The voltage-gated calcium channel is composed of a pore-forming α1 subunit and several regulatory subunits: α2δ, β, and γ. 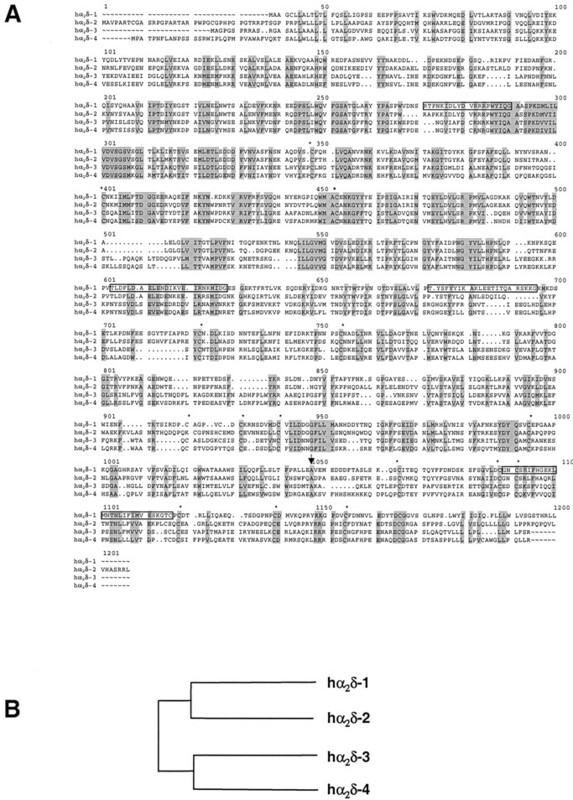 We report here the identification of a novel α2δ subunit, α2δ-4, from the expressed sequence tag database followed by its cloning and characterization. The novel α2δ-4 subunit gene contains 39 exons spanning about 130 kilobases and is co-localized with theCHCNA1C gene (α1C subunit) on human chromosome 12p13.3. Alternative splicing of the α2δ-4 gene gives rise to four potential variants, a through d. The open reading frame of human α2δ-4a is composed of 3363 base pairs encoding a protein with 1120 residues and a calculated molecular mass of 126 kDa. The α2δ-4a subunit shares 30, 32, and 61% identity with the human calcium channel α2δ-1, α2δ-2, and α2δ-3 subunits, respectively. Primary sequence comparison suggests that α2δ-4 lacks the gabapentin binding motifs characterized for α2δ-1 and α2δ-2; this was confirmed by a [3H]gabapentin-binding assay. In human embryonic kidney 293 cells, the α2δ-4 subunit associated with CaV1.2 and β3 subunits and significantly increased CaV1.2/β3-mediated Ca2+influx. Immunohistochemical study revealed that the α2δ-4 subunit has limited distribution in special cell types of the pituitary, adrenal gland, colon, and fetal liver. Whether the α2δ-4 subunit plays a distinct physiological role in select endocrine tissues remains to be demonstrated. Voltage-gated calcium channels mediate Ca2+ influx in excitable cells. Upon depolarization of the plasma membrane, a calcium channel undergoes a series of conformational changes initiated by the charge movement, which results in the opening of a pore or conductance pathway selective for the influx of calcium ions. Calcium channels are a diverse class of proteins that, based on their electrophysiological and pharmacological properties, have been traditionally classified into types L, T, N, P, Q, and R (for review, see Catterall, 2000). Except for the T-type calcium channel, which is a low-voltage–activated channel, the L-, N-, P-, Q-, and R-type are all high-voltage–activated channels, which are normally activated above −40 mV. A calcium channel is a multisubunit protein complex (Catterall, 2000) that is composed of a pore-forming α1 subunit (Perez-Reyes et al., 1989) and three regulatory subunits: α2δ, β, and γ. All of these subunits from rabbit have been characterized by molecular cloning (Tanabe et al., 1987; Ellis et al., 1988; Ruth et al., 1989;Jay et al., 1990). The α2δ and β subunits regulate almost all aspects of channel properties and increase the functional channel density on the cell surface (Lacerda et al., 1991). To date, at least 10 different types of calcium channel α1 subunits (Catterall 2000), four types of β subunits (for review, seeBirnbaumer et al., 1998), three types of α2δ subunits (Ellis et al., 1988; Klugbauer et al., 1999; Gao et al., 2000), and five types of γ subunits (Jay et al., 1990, Letts et al., 1998, Klugbauer et al., 2000) have been cloned and characterized. However, pharmacological and electrophysiological studies have identified more subtypes of voltage-gated calcium channels in excitable cells than the type of α1 subunits currently known. Therefore, either more α1 subunits and/or their splicing variants are present or the α2δ, β, and γ subunits also contribute to the pharmacological and electrophysiological diversity of calcium channels. In the later case, the diverse calcium channels are formed from different combinations of α1, α2δ, β, and γ subunits. The calcium channel α2δ subunit is a heavily glycosylated protein that is encoded by a single gene and post-translationally cleaved to yield α2 and δ subunits linked by a disulfide bond (De Jongh et al., 1990) with a single transmembrane segment (Gurnett et al., 1996; Wiser et al. 1996; Felix et al., 1997). The α2δ subunit regulates many functional aspects of calcium channels, such as gating, regulating voltage dependent kinetics, and increasing functional channel density on the plasma membrane (Shistik et al., 1995; Bangalore et al., 1996; Qin et al., 1998; Shirokov et al., 1998; Sipos et al., 2000). In addition to its regulatory functions, the α2δ subunit is also a site for ligand binding. Recently, the novel anticonvulsant drug, gabapentin (1-aminomethyl cyclohexane acetic acid), was shown to bind with high affinity directly to the calcium channel α2δ-1 subunit (Gee et al., 1996; Brown and Gee, 1998). This binding affects neuronal excitability by modifying calcium channel activity (Rock et al., 1993), which may be the drugs' underlying mechanism in controlling neuropathic pain (Field et al., 2000). Analyses of the Drosophila melanogaster genome have revealed four α1, three α2δ, one β, and γ subunit for calcium channels (Littleton and Ganetzky, 2000). Based on the ratio of α1 to α2δ (4 to 3) in D melanogaster, we proposed that more than three types of α2δ subunits must exist in mammals, although several alternative splicing variants of α2δ-1 and α2δ-2 subunits have been identified (Kim et al., 1992; Gilad et al., 1995; Angelotti and Hofmann 1996; Klugbauer et al. 1999; Hobom et al., 2000). In addition, no regulatory subunits of T-type channels (α1G to α1H) have yet been identified, further suggesting that additional calcium channel regulatory subunits may exist (Lacinova et al., 1999). Here, we report the molecular cloning of a putative novel α2δ subunit, α2δ-4. The α2δ-4 gene contains 39 exons spanning about 130 kb and is colocalized with a calcium channel α1 CaV1.2 gene on human chromosome 12. Alternatively spliced products were identified by molecular cloning and confirmed by genomic sequence analysis. 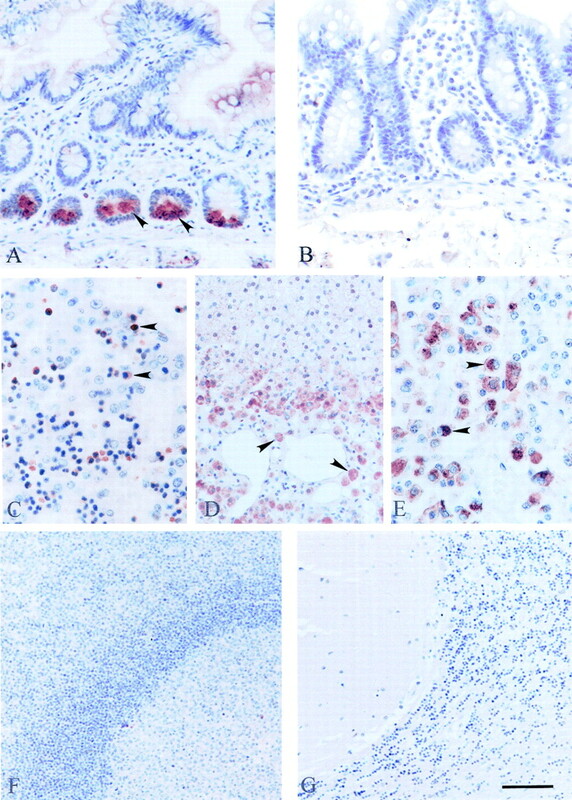 Studies of tissue distribution by Northern analysis and immunohistochemistry suggest that the α2δ-4 subunit is highly expressed in some endocrine cells. Rapid Amplification of cDNA Ends Coupled to Polymerase Chain Reaction. To clone the full-length human calcium channel α2δ-4 subunit, RACE-PCR followed by Nest-PCR was used. For both 5′ and 3′ RACE-PCR, several primers were synthesized based on the sequence of expressed sequence tag clone AA001473. Reverse primers, A2-4-9 (5′-CAG GGG CTG GGC TGC ACT GTG GTG GTG-3′) and A2-4-10 (5′-CTC TCG GGA CCT CTT GGA GAT CAG AAT-3′) were used for RACE-PCR of the 5′ end, and forward primer, A2-4-42 (5′-AGC ATG GGG GTG TTC AGC CAA GTG ACT-3′) was used for RACE-PCR of the 3′-end. Primary RACE-PCR was performed in a 50-μl final volume. The reaction mixture contained 5 μl of Marathon-Ready human brain cDNA purchased from BD Clontech (Palo Alto, CA), 5 μl of 10 × reaction buffer, 200 μM dNTP, 200 nM AP1 primer (BD Clontech), 200 nM specific primer A2-4-9, and 1 μl of 50 × Advatage2 DNA polymerase mixture (BD Clontech). The thermal cycler parameter for RACE-PCR was: initial denaturing at 94°C for 30 s, five cycles of 94°C/5 s and 72°C/4 min, five cycles of 94°C/5 s and 70°C/4 min, and 20 cycles of 94°C/5 s and 68°C/4 min. After RACE-PCR reaction, the nest PCR was performed to further enhance the amplification. The reaction mixture (in 50-μl final volume) contained: 5 μl of the RACE PCR product, 5 μl of 10× reaction buffer, 200 μM dNTP, 200 nM AP2 primer (BD Clontech), 200 nM specific primer A2-4-10, and 1 μl of 50× Advantage2 DNA polymerase mixture (BD Clontech). The thermal cycler parameters for the nest PCR reaction were identical to that of RACE-PCR. The nested PCR product was then subcloned with a TA Cloning kit (Invitrogen, Carlsbad, CA) and sequenced. The second round of RACE-PCR and nest PCR were identical to the first round with specific primers based on the sequences obtained from the previous RACE-PCR. The specific primers were A2-4-16 (5′-CAG GCT CTG AGC CTG CGA GCT GAG-3′) and A2-4-17 (5′-ATG TCG TGG TCG TGG TTG ATG ACC AT-3′). The 3′-end was cloned by one round of RACE-PCR with primer A2-4-42, and the product was directly subcloned with a TA cloning Kit without further nest PCR. The full-length sequence was confirmed by reverse transcription-PCR with specific primers based on RACE-PCR results. Assembly of Full-Length Human Calcium Channel α2δ-4 Subunit. The full-length human calcium channel α2δ-4 subunit was assembled and subcloned into pAGA3 vectors (Qin et al., 1997) according to standard molecular biology methods. Briefly, a 1.26-kb N-terminal fragment was subcloned into the pAGA3 vector. Two C-terminal fragments were first assembled in pBlueScript KS+ (Stratagene, La Jolla, CA), and the resulting 2.1-kb DNA fragment excised was then subcloned into pAGA3 containing the N terminus of hα2δ4 to generate the full-length human calcium channel α2δ-4 subunit, pAGA3/hα2δ-4. The final construct was confirmed by DNA sequencing. For expression in mammalian cells, the full-length cDNA was also subcloned into pcDNA3.1 expression vector (Invitrogen). Two peptide sequences derived from the human calcium channel α2δ-3 and α2δ-4 subunits were selected to raise polyclonal antibodies in rabbits. The peptides were: Ac-KVSDRKFLTPEDEASVC-amide for α2δ-4 (737–752 amino acids) and Ac-QLTNQDFLKAGDKENI-amide for α2δ-3 subunit (745–760 amino acids). The peptides were synthesized, and antibodies were raised and purified by BioSource International, Inc. (Camarillo, CA). The antibodies were tested by ELISA against the antigen peptides and affinity purified with the same peptides. The affinity-purified antibodies were used for immunoanalysis. Northern Blot Analysis of the Human Calcium Channel α2δ-4 Subunit Expression. The cDNA fragment encoding residues 1–270 of the human α2δ-4 subunit was used as a probe. To label the probe, 25 ng of the DNA fragment was denatured in a final volume of 45 μl at 99°C for 4 min. The denatured DNA probe was incubated with 5 μl of [α-32P]dCTP at 6000 Ci/mmol (Amersham Biosciences, Piscataway, NJ) and then transferred to the tube containing a Ready-To-Go DNA Labeling Bead (-dCTP) (Amersham Biosciences) and incubated at 37°C for 30 min. The labeled probe was then separated from free [α-32P]dCTP using a MicroSpin G-50 column (Amersham Biosciences). The labeled probe was denatured at 99°C for 4 min and immediately placed on ice before being added to the hybridization solution. A human multiple-tissue Northern blot was purchased from BD Clontech. The blots were prehybridized with 5 ml ExpressHyb Solution (BD Clontech) at 65°C for 4 h, and then hybridized in the presence of 2 × 106 cpm/μl of probe at 65°C overnight. The blot was washed twice with 200 ml of 0.2× standard saline citrate/0.1% SDS solution at 65°C for 2 h. Finally, the blots were exposed to X-ray film in a −80°C freezer for 1 to 3 days. A 2.0-kb cDNA fragment encoding human β-actin was used as a control probe. The same blots were stripped with 0.5% SDS solution at 90°C for 10 min and then used for hybridization under the same condition. The full-length cDNA of human calcium channel α2δ subunits were first subcloned into a pAGA3 vector, which were engineered for high efficiency of in vitro transcription and translation as described in Qin et al. (1997). In vitro translation of the human calcium channel α2δ subunits were performed with TnT T7 Quick Coupled Transcription/Translation System (Promega, Madison, WI) following the vendor-recommended protocol. Briefly, 0.5 μg of α2δ constructs were added to 40 μl of TNT Quick Master Mix with 1 μl of [35S]methionine (1000 Ci/mmol at 10 mCi/ml) in a final volume of 50 μl. The reaction mixtures were incubated at 30°C for 90 min. Reaction mixture (5 μl) was mixed with an equal volume of SDS/PAGE loading buffer and subjected to 4 to 12% SDS/PAGE analysis. After electrophoresis, the gels were dried for radioautography or transferred to nitrocellulose for further Western blot analysis. Commercial human checkerboard tissue slides (DAKO, Carpinteria, CA; Biomeda, Foster City, CA; Novagen, Milwaukee, WI) were deparaffinized, hydrated, and processed for routine immunohistochemistry as described previously (D'Andrea et al., 1998). Briefly, slides were microwaved in Target buffer (DAKO), cooled, placed in distilled water and then treated with 3.0% H2O2 for 10 min. Afterward, the slides were rinsed in phosphate-buffered saline (PBS), pH 7.4, processed through an avidin-biotin blocking system according to the manufacturer's instructions (Vector Labs, Burlingame, CA), and then placed in PBS. All subsequent reagent incubations and washes were performed at room temperature. Normal blocking serum (Vector Labs) was placed on all slides for 10 min. After briefly rinsing in PBS, primary antibody (affinity-purified anti-human α2δ-4 polyclonal antibodies, 1:1000 dilution) was placed on slides for 30 min. The slides were washed and a biotinylated secondary antibody, goat anti-rabbit was placed on the tissue sections for 30 min (Vector Labs). After rinsing in PBS, the horseradish peroxidase–avidin-biotin complex reagent (Vector Labs) was added for 30 min. Slides were washed and treated twice with the chromogen 3,3′-diaminobenzidine (Biomeda) for 5 min each, then rinsed in dH2O and counterstained with hematoxylin. A monoclonal antibody to vimentin, the widely conserved, ubiquitous intracellular filament protein, was used as a positive control to demonstrate tissue antigenicity and control reagent quality. The negative controls included replacement of the primary antibody with preimmune serum or with the same species IgG isotype nonimmune serum (Vector Labs). Transient Transfection and Cell Membrane Preparation. COS-7 cells were cultured in DMEM with 10%FBS at 37°C in 5% CO2 incubator. One day before transfection, about 5 × 106 COS-7 cells were seeded on 150-mm culture dishes. The cells were transfected with 20-μg DNA constructs using SuperFect transfection reagent (QIAGEN, Valencia, CA) following the protocol provided by the company. Membrane preparation was carried out at 4°C. Forty-eight hours after transfection, cells were washed with PBS and suspended in lysis buffer (10 mM HEPES, pH 7.4, and proteinase inhibitor cocktail). The cells were incubated on ice for 30 min followed by brief sonication. The cell debris was removed by centrifugation at 1,000g for 10 min, and the resulting supernatant was centrifuged for 30 min at 50,000g. The pellet was resuspended in the lysis buffer and kept at −80°C for Western blot analysis and gabapentin binding assay. Tissue Preparation and Protein Extraction. The tissue preparation and protein extraction were carried out by ResGen. Approximately 220 mg of each sample was finely chopped and placed in a microcentrifuge tube. Radioimmunoprecipitation assay buffer (150 mM NaCl, 1% Nonidet P-40, 0.5% deoxycholate, 0.5% SDS, and 50 mM Tris, pH 8.0) with protease inhibitors was added, and each sample was homogenized until the mixture was of a uniform consistency. Each sample was heated at 100°C for 10 min. Each sample was then centrifuged at 10,000 rpm for 10 min. The supernatants were removed and placed in clean tubes. The supernatants were centrifuged at 13,200 rpm for 30 min. The total protein concentration was determined by absorption at 280 nm. Proteins in the gel were transferred to nitrocellulose membrane at 25 V for 60 min. After being blocked with 2% fat dry milk in 0.5% Tween 20, 100 mM NaCl, and 10 mM Tris-HCl, pH 7.4, for 1 h at room temperature, the blot was then incubated with primary antibodies in 2% fat dry milk/0.5% Tween 20, 100 mM NaCl, and 10 mM Tris-HCl, pH 7.4, at 4°C overnight. The following primary rabbit polyclonal antibodies were used: anti-α2δ-1 (1:200 dilution) and anti-α1C (1:200) purchased from Alomone Labs, anti-β3 (1:200) purchased from Sigma, anti-α2δ-3 (1:200 dilution), and anti-α2δ-4 (1:500 dilution; seeGeneration of Polyclonal Antibodies). Secondary goat anti-rabbit IgG conjugated with horseradish peroxidase 1:10,000 (from Pierce) was incubated for 1 h at room temperature. Finally, the signals were visualized on X-ray film using the ECL Plus kit (Amersham). Because Anti-HA monoclonal antibody (Roche Diagnostics) was conjugated with peroxidase, the blot was directly treated with ECL-plus kit without using secondary antibody. Coimmunoprecipitation was carried out with cell lysates from transiently transfected HEK 293 cells by CaV1.2 (α1C), β3, and α2δ-4 tagged with HA epitope constructs. Two days after the transfection, the cells (from two 150-mm plates) were harvested and washed with PBS. The cells were then resuspended in 2 ml of detergent extraction buffer: 1% (v/v) Nonidet P-40, 0.5% deoxycholate, 150 mM NaCl, 5 mM EDTA, 50 mM Tris-HCl, pH 8.0, and 20 μl of protease inhibitor cocktail (Sigma), followed 10 passages each through 20- and 26-gauge needles. Cell extracts were cleared by centrifugation. Coimmunoprecipitation was carried out with 500 μl of the cell lysates in the presence of either 50 μl of anti-HA (rat monoclonal antibody) Affinity Matrix (Roche Diagnostics, Indianapolis, IN) or 50 μl of anti- CaV1.2 polyclonal antibody (Alomone Labs, Jerusalem, Israel)/50 μl of protein A Sepharose CL-4B (Pharmacia, Peapack, NJ). After overnight incubation at 4°C, the beads were precipitated by a brief centrifugation, and washed three times with 1 ml of lysis buffer. Finally, an equal volume of 2× SDS loading buffer was added, and 20 μl was subjected to 4 to 20% SDS. The coprecipitated subunits were then analyzed by Western blot with the indicated antibodies. HEK 293 cells were seeded in six-well plates (1.5 × 105/well) the day before the transfection. The cells were transfected with 1 μg of DNA constructs as indicated by using Genejammer transfection reagent (Stratagene) following the protocol provided by the company. After 24 h, the transfected cells were replated into a 96-well plate (2 × 103/100 μl/well) and incubated at 37°C/5% CO2 for another 24 h.
Calcium influx was measured with the Attofluor RatioVision real-time digital fluorescence analyzer (Atto Bioscience, Rockville, MD). The transfected HEK 293 cells were loaded with equal volume (100 μl) of Calcium Plus dye (Molecular Devices, Sunnyvale, CA) with 2.5 mM probenecid for 1 h at 37°C. The cells were depolarized by adding 50 mM KCl or the same volume of buffer as a negative control. The [Ca2+] in extracellular medium was 1.6 mM. The Calcium Plus dye was excited using a RatioArc High-Speed Excitor (Atto Bioscience) at 488-nm wavelength. Emitted light was transmitted through a 490-nm long-pass filter and collected to the Attofluor intensified charge-coupled device camera. The fluorescence dye single wavelength images were digitized, and analyzed, using Attofluor RatioVision software. Data from individual cells were collected from several experiments and exported into Microsoft Excel for further analysis. The gabapentin binding assay was based on the protocol developed by Gee et al. (1996). The binding assay was carried out in a final volume of 200 μl containing 40 μg of cell membrane, 20 nM [3H]gabapentin (127 Ci/mmol), and 10 mM HEPES buffer, pH 7.4. After incubation at room temperature for 1 h, the reaction mixture was filtered onto prewetted GF/C membranes and washed four times with ice-cold saline. The filters were then dried and counted in a liquid scintillation counter. Identifying and Cloning A Novel Human α2δ Subunit. The key words “Calcium Channel” were used to search the GenBank nonredundant DNA database. Twenty-nine hits were identified as related to α2δ subunits. Further sequence analysis led to the identification of two overlapping expressed sequence tag clones that might encode a novel human calcium channel α2δ subunit, with GenBank accession numbersAA001473 (572 bp in length) and H86016 (306 bp in length). The two clones were almost 100% identical in the 292-bp overlapping region, suggesting that they might arise from the same gene. The amino acid sequence derived from the longer clone, AA001473, was 40% identical to the mouse calcium channel α2δ-3 subunit over residues 839 to 977 (GenBank accession number AJ010949), 36% identical to the human calcium channel α2δ-2a subunit over residues 870 to 949 (GenBank accession number AF042793), and 34% identical to the human calcium channel α2δ-1 subunit from residues 836 to 927 (GenBank accession number NM_000722), suggesting that it may encode a novel α2δ. We used the RACE-PCR to clone its full-length cDNA and confirmed by reverse transcription-PCR. Sequence analysis of the RACE-PCR products revealed the existence of two different amino termini and two different carboxyl termini of the novel human α2δ subunit. The different amino and carboxyl termini resulted from the alternative splicing (see next section); theoretically, therefore, there may be four different combinations, or subtypes of α2δ-4 subunits. We named them α2δ-4a through −4d. As shown in Fig. 1, the first amino terminus (encoded by exon 1, Fig. 2) has a long 5′ untranslated region and several putative start codons downstream of the in-frame stop codon. The first ATG, 87 bp downstream of the in-frame stop codon, is unlikely to be the translational initiation site because it lacks the typical Kozak sequence feature (5′-GCCA/GCC AUG G-3′, Kozak, 1991) at its adjacent sequence (the bold, underlined characters indicate the conserved Kozak sequence.) The second and third ATGs are 288 and 336 bp downstream of the in-frame stop codon, respectively. Comparison of the adjacent sequences of the second ATG ( G AGCT CATGG ) and the third ATG (C CCACCATG C) revealed that the third one is closer to a perfect Kozak sequence. If the translation starts at the third ATG, it will have a relatively long signal peptide (51 amino acids), which is very similar in length to that of the human α2δ-2 subunit (61 amino acids). Therefore, the third ATG most probably serves as the translational initiation site. However, we should be aware that the ATG serving as a start codon in tissues needs to be examined by further experiments. The second type of amino terminus (encoded by exon 1B) contains a 190-bp 5′ untranslated region and an in-frame stop codon (TGA) at 30 bp upstream from the first ATG. The adjacent upstream sequence (CAG GCCATG G, especially the Gs at positions −3 and +4) of the first ATG confers the Kozak sequence, suggesting that it is probably a site for translational initiation. However, this amino terminus does not encode a typical signal peptide, which may result in a different topology from other α2δ subunits. Its biological significance needs to be determined. 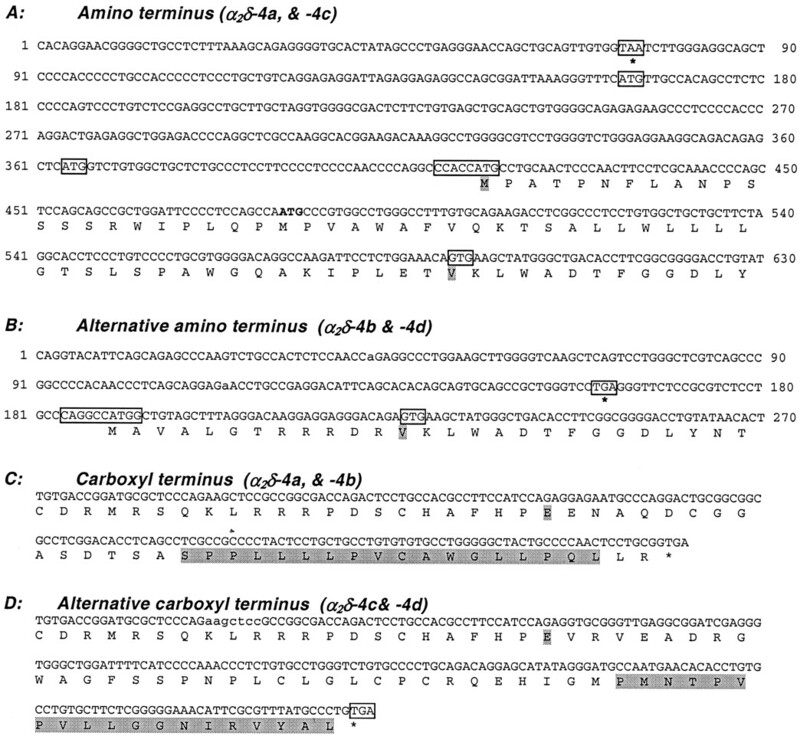 Alternative splicing of amino and carboxyl termini of human α2δ-4 subunit. A and B, nucleotide and deduced amino acid sequences of two different amino termini. The amino terminus encoded by exon 1 (A) consists of a putative signal peptide, whereas the one encoded by exon 1B (B) does not. C and D, nucleotide and deduced amino acid sequences of two different carboxyl termini encoded by exons 38 (C) and 37L (D). The putative hydrophobic membrane-spanning domains are highlighted. Human α2δ-4 subunit gene (CACNA2D4) structure. Human CACNA2D4 gene is composed of 36 invariant exons (exons 2–37) and four alternative exons (exons 1, 1B, 37L, and 38) that span about 130 kb of human chromosome 12p13.3. Exon 37L is continuously extended from exon 37 with an in-frame stop codon. Exons 1 and 1B both have an in-frame start codon, and exon 38 has an in-frame stop codon, indicating that there are four possible alternative splicing variants. The human calcium channel α2δ-4a subunit is encoded by exons 1 and 38 with 37 invariant exons (2–37), whereas human α2δ-4b is encoded with alternative exons 1B and 2 to 38. Another two putative splicing variants are α2δ-4c (exons 1–37L) and α2δ-4d (exons 1B and 2–37L). The two different types of carboxyl termini (Fig. 1) are also encoded by two exons, 38 and 37L. Exon 37L is a longer version of exon 37 with an in-frame stop codon (Fig. 2). Both carboxyl termini contain a highly hydrophobic region that may serve as a single transmembrane domain. The open reading frame of human α2δ-4a is composed of 3363 bp encoding a peptide with 1120 amino acids. The calculated molecular mass is about 126 kDa with pI = 5.16. The derived protein has most of the features of the known α2δ subunits, including a putative signal sequence at the amino terminus, a single transmembrane domain at the carboxyl terminus or the δ subunit, a conserved alanine residue at the breaking point between the α and δ subunit, and six putativeN-glycosylation sites, which is fewer than other α2δ subunits (16, 18, and 9 putative sites for α2δ-1, -2, and -3, respectively). In addition, there are up to 15 cysteine residues in the protein that are conserved in all the known α2δ subunits, which are believed to play a critical role in associating α and δ subunits together to form a functional subunit. As shown in Fig.3, the primary sequence of α2δ-4a is 30, 32, and 61% identical to the human calcium channel α2δ-1, α2δ-2, and α2δ-3 subunits, respectively. The most conserved regions across all four subunits are clustered in between amino acids 200 and 600 in the α2 subunit region; the longest stretch of conserved fragment is 15 residues. The human α2δ-4 subunit also contains two putative protein kinase A phosphorylation sites (at residues 107 and 680) and 15 protein kinase C sites, similar to those contained in other known α2δ subunits. However, like the α2δ-3 subunit, no putative tyrosine kinase phosphorylation site was identified on the α2δ-4 subunit. Based on these molecular signatures, we believe that this novel protein belongs to the calcium channel α2δ subunit family. Comparison of four types of human α2δ subunits. A, amino acid sequences alignment of human α2δ-1 (GenBank accession number NM_000722), human α2δ-2 (GenBank accession number AF042793), human α2δ-3 (GenBank accession number AF516696) and human α2δ-4 (GenBank accession number AF516695). Regions that are identical and highly homologous in all four subunits are shaded. All 15 conserved cysteine residues in four subunits and breaking point between α2 and δ subunits are indicated by asterisks or an arrow, respectively. Four regions of α2δ-1 subunit required for gabapentin binding are boxed. B, phylogram. The human α2δ-4 subunit is 30, 32, and 61% identical to human α2δ-1, α2δ-2, and α2δ-3 subunits, respectively. Genomic Structure and Splicing Variants of Human Calcium Channel α2δ-4 Subunit. The full-length cDNA sequence of the human calcium channel α2δ-4 subunit was used for a blast search of the GenBank human genome database. 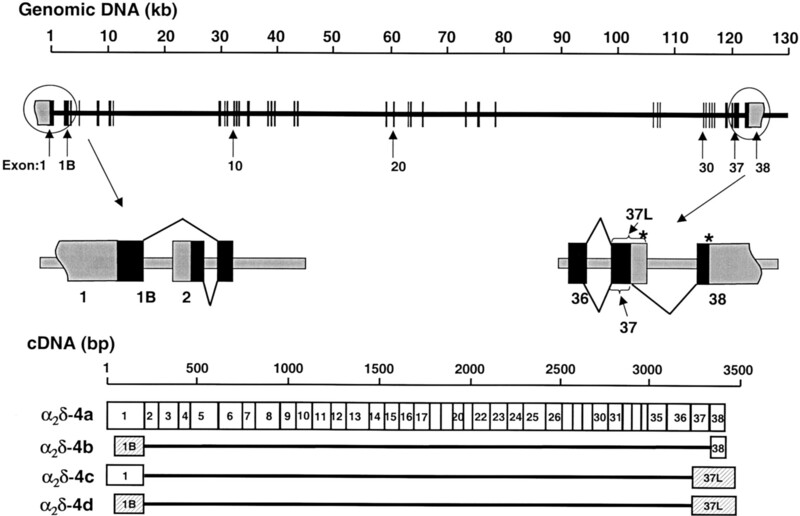 The result revealed that the gene CACNA2D4 encoding the human α2δ-4 subunit is localized at chromosome 12p13.3, about 400 kb away from the locus of CACNA1C the gene of the human L-type calcium channel CaV1.2 (α1C) subunit (Soldatov, 1994). As shown in Fig. 2 and Table 1, the gene encoding the human calcium channel α2δ-4 subunit is composed of 36 invariant exons (exon 2-exon 37) and 4 alternative exons (exon 1, 1B, 37L and 38) spanning about 130 kb of the human genome. Exon 37L is continuously extended from exon 37 with an in-frame stop codon. The genomic sequence confirms the RACE-PCR results in regard to alternative splicing. The human calcium channel α2δ-4a subunit is encoded by exon 1 through exon 38, while human α2δ-4b is encoded with the alternative exon 1B and exon 2 to 38. Two additional putative splicing variants are α2δ-4c (exons 1–36 and exon 37L) and α2δ-4d (exon 1B and exons 2–37L). Tissue Distribution of Human α2δ-4 Subunit. Northern blot analysis using a human α2δ-4 N-terminal specific probe (1–810 bp) showed that the human α2δ-4 transcript is about 7 kb and is most abundant in human heart and skeletal muscle (Fig.4). The message level was very low in other tissues including brain, placenta, lung, liver, kidney and pancreas. The expression pattern of α2δ-4 was different from that of human α2δ-3, which was predominantly expressed in brain (Klugbauer et al., 1999). 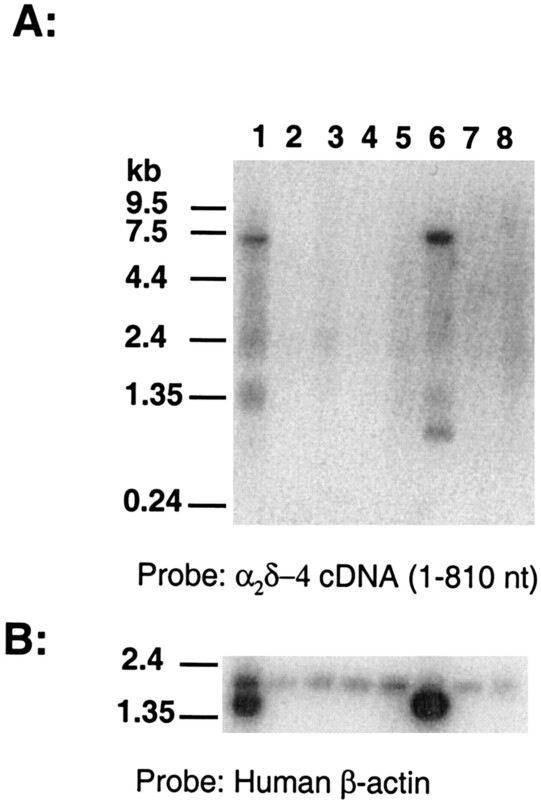 Northern blot analysis of human α2δ-4 subunit gene expression. A, human multiple tissue blot (BD Clontech) hybridized with radioactively labeled human α2δ-4 subunit probe. B, same blot rehybridyzed with human 2.4-kb β-actin probe (provided by BD Clontech) after stripping α2δ-4 subunit probe with 0.5% SDS at 90 °C for 15 min. Lane 1, heart; lane 2, brain; lane 3, placenta; lane 4, lung; lane 5, liver; lane 6, skeletal muscle; lane 7, kidney; and lane 8, pancreas. 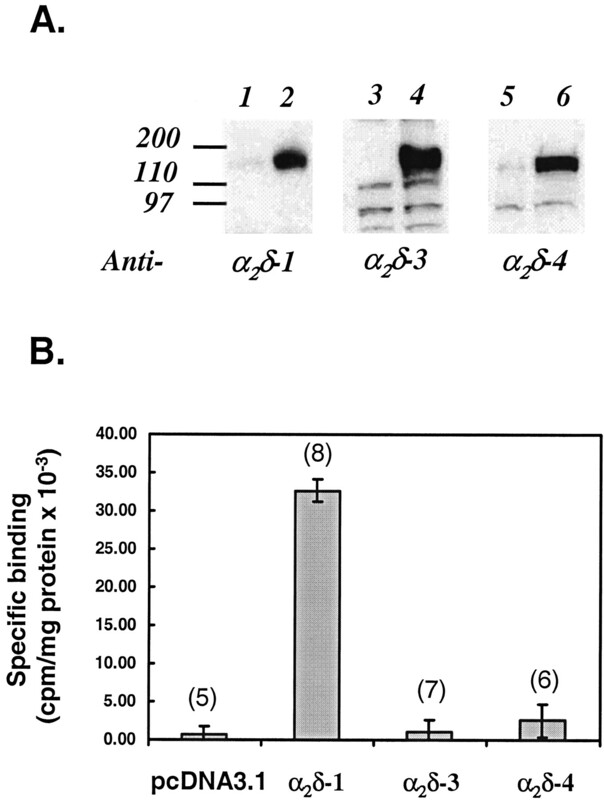 To analyze the α2δ-4 protein expression, a specific anti-α2δ-4 polyclonal antibody was generated and affinity-purified with a unique peptide corresponding to the residues 737–752 of α2δ-4a subunit. Ab specificity was determined by Western blot with in vitro translated α2δ subunits. Figure5A-5C show that the anti-α2δ-4 Ab specifically recognized the α2δ-4a subunit without cross-reacting with any other type of α2δ subunits. Characterization of anti-α2δ-3 and anti-α2δ-4 subunit polyclonal antibodies. A to C, characterization of antibodies. SDS –PAGE and autoradiograph analysis of four different types of in vitro translated α2δ subunit (A), Western blot analysis of in vitro translated α2δ subunits with anti-α2δ-3 (B), and anti-α2δ-4 (C) antibodies. D, Western blot analysis of α2δ-4 subunit expression in selected human tissues. The blot was purchased from ResGen (Invitrogen). Total proteins (100 μg) from each tissue were subjected to 3 to 8% Tris-acetate gel. Lane 1, brain; lane 2, pituitary; lane 3, adrenal gland; lane 4, pancreas; and lane 5, heart. Immunohistochemical study with the affinity purified anti-human α2δ-4 specific antibody revealed differential expression of the α2δ-4 subunit in human tissues. Prominent immunolabeling was observed in the Paneth cells of the small intestines (Fig. 6A), which was not observed in the preabsorption control experiments of similar tissues (Fig. 6B). Positive α2δ-4 immunolabeling was also observed in the erythroblasts (arrowheads) in the fetal liver (Fig. 6C), in the cells of the zona reticularis (arrowheads) of the adrenal gland (Fig. 5D), and in the basophiles (arrowheads) of the pituitary (Fig. 6E). Consistent with the Northern blot result, the immunostaining signal was weak in some brain regions such as cerebellum (Fig. 6G) and cerebral cortex. In addition, immunostaining by α2δ-4 antibody was not detected in many other tissues, such as tonsil (Fig. 6F). Immunohistochemical analysis of α2δ-4 subunit expression in human tissues. A, Paneth cells (arrowheads) of the small intestine. B, no α2δ-4 immunolabeling was detected in the preabsorption control of the small intestine. Also, α2δ-4 immunolabeling was detected in the fetal liver erythroblasts (arrowheads) (C), in the cells of the zona reticularis (arrowheads) of the adrenal gland (D), and in the adrenal gland basophiles (arrowheads) of the pituitary (E). No α2δ-4 immunolabeling was detected in the tonsil (F) and cerebellum (G). Bar, 75 μm (A, B), 25 μm (D, F, G), or 100 μm (C, E). The expression of the α2δ-4 subunit in human tissues was further confirmed by Western blot analysis (Figure 5D). As shown in Figure 5D, an immunoreactive peptide with apparent molecular mass of ∼160 kDa was detected in pituitary and adrenal gland. A similar immunoreactive peptide, present at a relatively lower level, was also detected in brain tissue. The apparent difference between this result and the immunohistochemical labeling shown in Figure 6G may derive from the differing sensitivities of the two immunoassays and of the use of samples from different brain regions in the each assay. It is also notable that the relatively high messenger RNA level of the α2δ-4 subunit in human heart (Figure 4) was not paralleled by high protein levels evaluated by immunohistochemical or Western blotting techniques. Formation of Protein Complex in HEK293 Cells. Because the calcium channel is a multisubunit protein complex, a functional α2δ-4 subunit, like other known α2δ subunits, would be a component of the complex. Formation of a stable complex of α2δ-4 with other channel subunits was tested by coimmunoprecipitation. The α2δ-4a subunit was first tagged with an HA epitope and cotransfected with CaV1.2 and β3 subunits into HEK cells. The cell lysates were immunoprecipitated by either immobilized anti-HA monoclonal Ab or anti-CaV1.2 polyclonal Ab/Protein-A bead. The coprecipitated subunits were then analyzed by Western blot. Figure 7 shows that α2δ-4a associated with CaV1.2 and β3 after cotransfection in HEK293 cells. The expression of all three subunits in HEK293 cells was confirmed by Western blot (Figure 7A). In addition, α2δ-4a(HA) was detected by both anti-α2δ-4 and anti-HA Abs. In Figure 7B, α2δ-4a(HA) was immunoprecipitated from lysates with anti-HA Ab, and the presence of CaV1.2 (lane 2), α2δ-4a (lane 4), and β3 (lane 6) in the precipitates were tested by Western blot with anti-CaV1.2, α2δ-4 and β3polyclonal Abs. Under the same condition, no subunits were immunoprecipitated from the cells transfected by only vector, pcDNA3.1, (Fig. 7B, lanes 1, 3, and 5). A reciprocal immunoprecipitation of CaV1.2 subunit from the same lysates was performed by using anti-CaV1.2 Ab/protein-A beads, and the presence of α2δ-4(HA) was determined by Western blot with anti-HA Ab (Fig. 7C). The specific co-immunoprecipitation of α2δ-4(HA) subunit was further confirmed by a negative control (Fig. 7C, lane 1), in which only protein-A beads were added. α2δ-4 subunit associates with CaV1.2 and β3 subunits in HEK293 cells. Reciprocal co-immunoprecipitation of CaV1.2, β3, and α2δ-4 (HA tagged) subunits. The HEK392 cells were transiently cotransfected by mammalian expression construct of CaV1.2, β3, and α2δ-4-HA. Two days after transfection, the cells were lysed and expressed, and subunits were analyzed by Western blot (A). 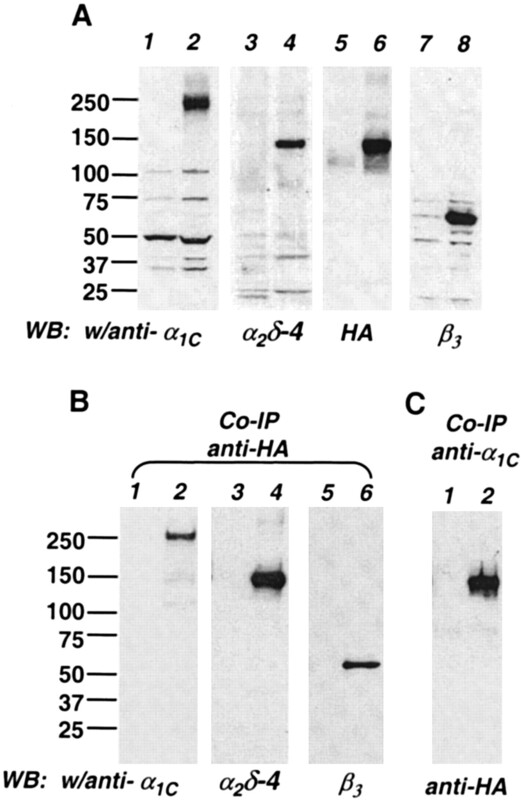 The cell lysates were then immunoprecipitated with either anti-HA monoclonal antibody (B) or anti-α1C polyclonal antibody (C), and immunoprecipitates were analyzed by Western blots with indicated antibodies. Augmentation of CaV1.2/β3-Mediated Ca2+ Influx in HEK293 Cells. One remarkable role of the α2δ subunit is to increase levels of functional channel on the plasma membrane and thereby greatly enhance ionic current in the presence of the second regulatory subunit, the β subunit. To test whether α2δ-4 subunit plays a similar role, we compared the CaV1.2/β3 mediated Ca2+ influx in the presence and absence of the α2δ-4a subunit. The transfected HEK293 cells were loaded with Calcium Plus dye and depolarized by adding KCl to a final concentration of 50 mM. The changes in fluorescence intensity were measured with the Attofluor RatioVision. For analysis of the data, the fluorescence intensity changes were averaged from each individual cell regardless of whether they were expressing all the inputting subunits. However, we did exclude the cells lacking any KCl response, because vector-only transfected cells showed very little response to KCl activation (data not shown). As shown in Figure8, upon depolarization, the Ca2+ influx in transfected cells was mediated by a Nifedipine sensitive Ca2+ channel, presumably by over-expressed CaV1.2 L-type Ca2+ channel. The Ca2+influx in CaV1.2 transfected cells was significantly increased (∼3-fold) by co-transfection of β3 subunit. The effect was further increased to 6-fold in the presence of both β3 and α2δ-4 subunits. This result suggests that α2δ-4 subunit may play a similar basic role in formation a functional channel. The α2δ-4 subunit increase CaV1.2/β3 mediated Ca2+ influx in HEK293 cells. Transfected cells by different combination of expression constructs as indicated were loaded with Calcium Plus dye for 1 h at 37°C. The cells were then, depolarized by adding 50 mM KCl and the intracellular [Ca2+] changes were measured in individual cells by fluorescence videomicroscopy using the Attofluor Digital Imaging system. The [Ca2+] in extracellular medium was 1.6 mM. To block Ca2+ influx, 10 μM of nifedipine was added before the depolarization. A, time course of average fluorescence intensity changes after depolarization. B, statistic analysis of changes of peak fluorescence intensity after depolarization. Each bar graph represented the means ± S.E.M. of peak fluorescence changes regardless whether all the subunits were expressed in an individual cell but excluded the cells without KCl response. The number of cells was indicated on each bar graph. Gabapentin is a novel anticonvulsant drug that is also used clinically for treatment of neuropathic pain. A high-affinity gabapentin-binding site was found in brain and skeletal muscle, subsequently identified as the calcium channel α2δ-1 subunit (Gee et al., 1996). More recently, Marais et al. (2001) demonstrated that gabapentin also interacted with the calcium channel α2δ-2 subunit but not with the α2δ-3 subunit. To determine whether gabapentin bound to the human α2δ-4 subunit, we assessed specific gabapentin binding of three different types of α2δ subunit. The α2δ-1, α2δ-3, and α2δ-4 subunits were first overexpressed in COS-7 cells by transient transfection. The membrane fractions were made 48 h after transfection and incubated with [3H]gabapentin at room temperature for 1 h. The membranes were subsequently filtered, and gabapentin binding to the membrane was quantified by scintillation counting. As shown in Fig.9, gabapentin bound to the α2δ-1 subunit with a relatively high affinity, but it failed to bind to either the α2δ-3 or α2δ-4 subunits. This result is consistent with Marais' observation (Marais et al. 2001) and further supports the gabapentin binding pharmacophore characterized by Wang et al. (1999), which is present in the α2δ-1 and α2δ-2 but not in the α2δ-3 and α2δ-4 subunits. Gabapentin does not bind to α2δ-4. COS-7 cells were transiently transfected α2δ subunit expression constructs and parental vector, pcDNA3.1, separately. After 48 h, transfected cells were collected and membrane fraction was made. A, Western blot analysis of membrane fractions. Membrane protein (50 μg) from each sample was subjected to 4 to 12% SDS-PAGE and transferred to nitrocellulose after electrophoresis. The blots were probed with anit-α2δ-1, -3, and -4 polyclonal antibodies, respectively. Lanes 1, 3, and 5, cells transfected by pcDNA3.1; lane 2, by α2δ-1/pcDNA3.1; lane 4, transfected by α2δ-3/pcDNA3.1; and lane 6, by α2δ-4/pcDNA3.1. B, [3H]gabapentin binding to the membrane fraction of transfected cells. The assay was performed at room temperature with 40 μg of total membrane protein from each sample and 20 nM [3H]gabapentin in a final volume of 200 μl. Values are the means ± S.D. of numbers of experiments indicated on top of each bar. We report here the molecular cloning and characterization of a novel human voltage-gated calcium channel α2δ-4 subunit and its amino and carboxyl terminal splicing variants. We also characterized its gene structure and determined its tissue distribution pattern by Northern blot analysis and immunohistochemistry. We conclude that this novel protein is a new member of the α2δ subunit family based on the following observations. First of all, the α2δ-4 subunit shares 30, 32, and 61% identity with human calcium channel α2δ-1, α2δ-2, and α2δ-3 subunits, respectively. Secondly, the α2δ-4 subunit possesses most of the known α2δ subunits molecular features. These include a potential signal sequence at the amino terminus, a transmembrane domain at the carboxyl terminus, 15 conserved cysteine residues, multiple glycosylation sites, and conserved regions clustered on the α2 portion. Finally, when the α2δ-4 subunit was expressed in HEK293 cells, it formed a protein complex with CaV1.2 and β3 subunits (Fig. 7), and increased Ca2+ influx mediated by CaV1.2/β3 channel (Fig.8). Comparison of the primary sequences of all the α2δ subunits (Fig. 3) also showed that the α2δ-1 and α2δ-2 subunits belong to one subfamily, whereas the α2δ-3 and α2δ-4 subunits belong to another subfamily. Interestingly, although the α2δ-4 subunit is most similar to the α2δ-3 subunit in primary sequence, its tissue distribution pattern is quite different. The reported protein distribution of the α2δ-3 is predominately in brain tissue (Klugbauer et al., 1999), whereas the α2δ-4 subunit is in certain types of endocrine cells, suggesting that α2δ-3 and α2δ-4 may play regulatory roles in different tissues. Like the α2δ-2 subunit, one of the N-terminal isoforms of the α2δ-4 subunit (α2δ-4a) consists of a potential signal sequence, whereas another (α2δ-4b) does not. The isoform without the potential signal peptide may not form a typical α2δ subunit membrane topology and will not be highly glycosylated, which is believed to be critical for the regulatory activity of α2δ subunits. However, the existence and biological function of the α2δ subunit isoforms without a putative signal peptide is still not understood. It will be interesting to see whether the isoform with such different membrane topology plays a different role in the regulation of calcium channel activity. The α2δ-1 subunit is known to increase the number of functional channels on the cell surface and to alter the binding of neurological and cardiovascular drugs to the ion channel pore-forming α1 subunit. Recently, it has been shown that the calcium channel α2δ subunit contains a binding site for gabapentin (Gee et al. 1996). Gabapentin may control neuronal excitability by modifying calcium channel activity (Rock et al. 1993) providing its therapeutic role in epilepsy and neuropathic pain. Recently, Wang et al. (1999) has identified four regions on α2δ subunit that are required for gabapentin binding. The similar binding motif may exist in the α2δ-2 subunit, but not in the α2δ-3 and the novel α2δ-4 subunits. In support of this notion, we found that α2δ-3 and α2δ-4 subunits do not bind to gabapentin. Obviously, gabapentin might be a less safe medication if it bound to all subtypes of α2δ subunits and subsequently altered the activity of all calcium channels. The finding that gabapentin binds neither to the α2δ-4 subunit (present study) nor to the α2δ-3 subunit (Marais et al., 2001) may partially explain why gabapentin has certain clinical properties or alters only certain types of calcium channel activities. At this point, we cannot exclude the possibility that the effect of gabapentin may also depend on the specific types of α1 and β subunits that are associated with the gabapentin-binding α2δ subunits (α2δ-1 and α2δ-2). Because the gene encoding the α2δ-4 subunit is colocalized with the α1C subunit (CaV1.2) on human chromosome 12p13.3, with a distance of only about 400 kb, an obvious question would be whether these two subunits associate to form a functional channel in native tissue. It is well known that the major subtypes of CaV1.2 (α1C) are predominantly expressed in heart, smooth muscle and brain, a distribution significantly different from that of the α2δ-4 subunit reported here (Fig. 6) in the pituitary, adrenal gland, small intestines, and fetal liver tissue. This suggests that the α2δ-4 subunit is not a component of L-type channel in heart, brain, and smooth muscle. Interestingly, the CaV1.2c (α1C-C, or rbC-I/rbc-II), one of the splicing variants of the α1C subunit, is also expressed in pituitary and adrenal gland (Snutch et al., 1991), a localization consistent with that of the α2δ-4 subunit. In addition, several other types of α1 subunits, such as CaV1.3, CaV2.1, and CaV2.3 are also expressed in pituitary. Further study will be necessary to elaborate the physiological role of calcium channel α2δ-4 subunit. The limited expression pattern of the α2δ-4 subunit in normal human tissues also includes possible roles in the processes of erythrogenesis as the erythroblasts loose their nuclei. Also, the presence of the α2δ-4 subunit in the cells of the pituitary and adrenal glands and in the Paneth cells of the small intestine suggests its roles in calcium-mediated exocytosis. We thank Drs. Mike X. Zhu and Rich R. Ryan for their critical discussion of the manuscript, and Patti A. Reiser, Norah A. Gumula, Brenda M. Hertzog, and Debbie Polkovitch for their histological and immunohistochemical expertise. (1996) Tissue-specific expression of splice variants of the mouse voltage-gated calcium channel α2/δ subunit. FEBS Lett 397:331–337. (1996) Influence of L-type channel α2/δ-subunit on ionic and gating current in transiently transfected HEK 293 cells. Am J Physiol 270:H1521–H1528. (1998) Structures and functions of calcium channel β subunits. J Bioenerg Biomembr 30:357–375. (1998) Cloning and deletion mutagenesis of the alpha2 delta calcium channel subunit from porcine cerebral cortex. Expression of a soluble form of the protein that retains [3H]gabapentin binding activity. J Biol Chem 273:25458–65. (1998) Characterization of protease activated receptor (PAR-2) immunoreactivity in normal human tissues. J Histochem Cytochem 46:1–8. (1990) Subunits of purified calcium channels: α2 and δ are encoded by the same gene. J Biol Chem 265:14738–41. (1988) Sequence and expression of mRNAs encoding the alpha 1 and alpha 2 subunits of a DHP-sensitive calcium channel. Science (Wash DC) 241:1661–1664. (1997) Dissection of functional domains of the voltage-dependent Ca2+ channel alpha2delta subunit. J Neurosci 7:6884–6891. (2000) Further evidence for the role of the α2δ subunit of voltage dependent calcium channels in models of neuropathic pain. Br J Pharmacol 131:282–286. (2000) Functional properties of a new voltage-dependent calcium channel alpha2delta auxiliary subunit gene (CACNA2D2). J Biol Chem 275:12237–42. (1995) Identification of the alternative spliced form of the alpha 2/delta subunit of voltage sensitive Ca2+ channels expressed in PC12 cells. Neurosci Lett 193:157–160. (1996) Dual function of the voltage-dependent Ca2+ channel alpha 2 delta subunit in current stimulation and subunit interaction. Neuron 16:431–440. (1990) Primary structure of the gamma subunit of the DHP-sensitive calcium channel from skeletal muscle. Science (Wash DC) 248:490–492. (1992) Rat brain expresses an alternatively splicing form of the dihydropyridine-sensitive L-type calcium channel α2 subunit. Proc Natl Acad Sci USA 89:3251–3255. (1999) Molecular diversity of the calcium channel alpha2delta subunit. J Neurosci 19:684–691. (2000) A family of gamma-like calcium channel subunits. FEBS Lett 470:189–189. (1991) An analysis of vertebrate mRNA sequences: intimations of translational control. J Cell Biol 115:887–903. (1991) Normalization of current kinetics by interaction between the alpha 1 and beta subunits of the skeletal muscle dihydropyridine-sensitive Ca2+ channel. Nature (Lond) 352:527–530. (1999) Absence of modulation of the expressed calcium channel α1G subunit by α2δ subunits. J Physiol 516:639–645. (1998) The mouse stargazer gene encodes a neuronal Ca2+ channel γ subunit. Nat Genet 19:340–334. (2000) Ion channels and synaptic organization: analysis of the Drosophila genome. Neuron 26:35–43. (2001) Calcium channel α2δ subunit-structure and gabapentin binding. Mol Pharmacol 59:1243–1248. (1989) Induction of calcium currents by the expression of the alpha 1-subunit of the dihydropyridine receptor from skeletal muscle. Nature (Lond) 340:233–236. (1998) Modulation of human neuronal α1E type calcium channel by α2δ subunit. Am J Physiol 274:C1324–C1331. (1997) Direct interaction of Gβγ with a C-terminal Gβγ -binding domain of the Ca2+ channel α1 subunit is responsible for channel inhibition by G protein-coupled receptors. Proc Natl Acad Sci USA 94:8866–8871. (1993) Gabapentin actions on ligand- and voltage-gated responses in cultured rodent neurons. Epilepsy Res 16:89–98. (1989) Primary structure of the beta subunit of the DHP-sensitive calcium channel from skeletal muscle. Science (Wash DC) 245:1115–1118. (1995) Ca2+ current enhancement by α2/δ and β subunits in Xenopus oocytes: contribution of changes in channel gating and α1 protein level. J Physiol 489:55–62. (1998) Inactivation of gating currents of L-type calcium channels: specific role of the α2δ subunit. J Gen Pysiol 111:807–823. 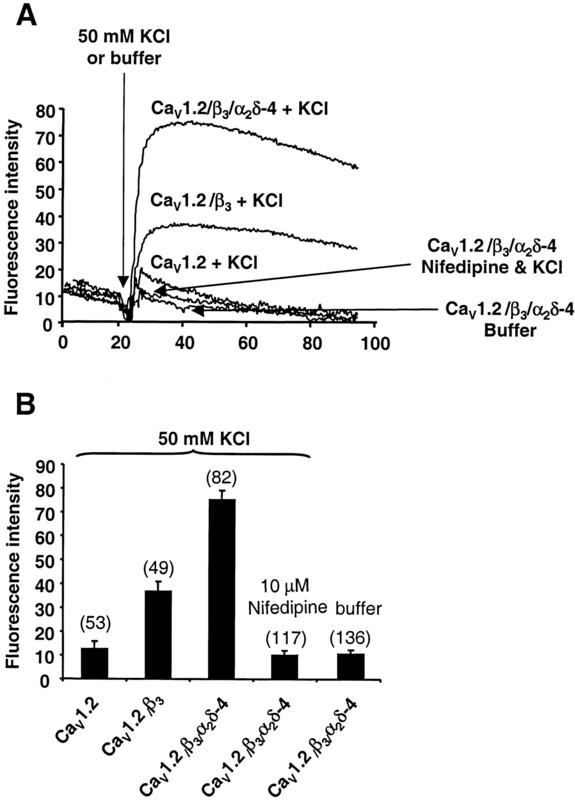 (2000) Effects of the dihydropyridine receptor subunits γ and α2δ on the kinetics of heterologously expressed L-type Ca2+ channels. Pflueg Arch Eur J Physiol 439:691–699. (1991) Distinct calcium channels are generated by alternative splicing and are differentially expressed in the mammalian CNS. Neuron 7:45–45. (1994) Genomic structure of human L-type Ca2+ channel. Genomics 22:77–78. (1987) Primary structure of the receptor for calcium channel blockers from skeletal muscle. Nature (Lond) 328:313–318. (1996) The alpha 2/delta subunit of voltage sensitive Ca2+ channels is a single transmembrane extracellular protein which is involved in regulated secretion. FEBS Lett 379:15–20.